Google today made Google Search more entertaining to use with the addition of fun facts. The feature is starting small. 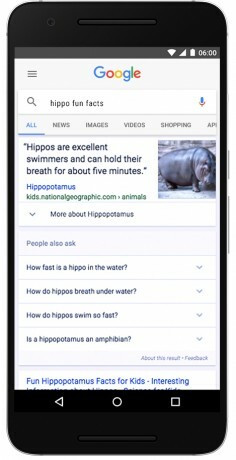 Users can type in queries such as "hippo fun facts" and Google Search will display a unique and interesting fact about hippos that may not be well known (apparently hippos can hold their breath for up to five minutes.) What to know more? Refresh the search and Google will display a second fun fact about the search subject. Standard, in-depth results will still be listed below the fun facts, which appear at the top of the results page. Google suggests people stick with fun facts about animals, plants, fruits, and vegetables for now.